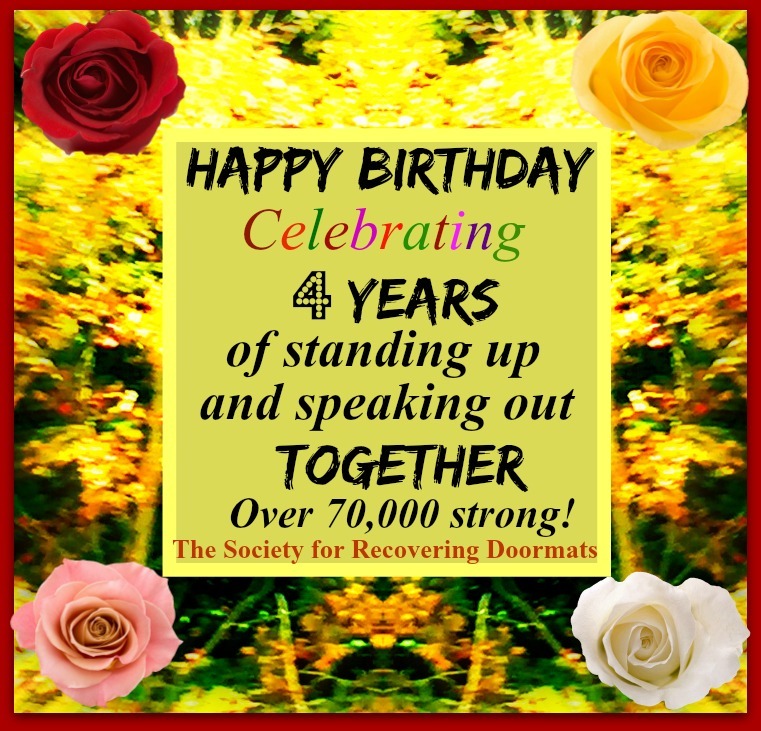 The Society for Recovering Doormats turns 4 today. Four years ago today, I began my site on Facebook. A few months later I expanded to this blog site. In late November of 2014 My Life as a Doormat, a novel I’d spent 10 years developing, was published. In 2015 I started my book tour, many signings and events at Barnes and Nobles in Florida. I also opened an on-line-store on Cafe Press. I’m a little technology challenged, but by some miracle by the end of 2015 I managed to get onto most social media platforms. I also began work on my second novel; a sequel to My Life as a Doormat. During 2016 I continued touring in Florida, and included New Jersey, New York City and Asheville North Carolina. August’s highlight was being interviewed on a PBS TV show called Between The Covers. Since I was an actor long before writing, I was very excited to do the show, and my interest for getting back into ‘show biz’ renewed. So here I am, 4 years, a book, and 70, 400 followers later, wondering what to do next? Many thanks to all sharing my vision and supporting my journey. Congratulations as I read your posts all the time and I must say that they have been very helpful to me. I have not read your books just yet but I plan on it. I’ve shared your posts with my Facebook friends and I always get positive results from my friends. I still stay away from my family as they are very Toxic to me. They have put me down for 64 years and I will stay away from them. I’m a better person for it. I will start radiation therapy very soon as my cancer has returned. Please save a copy of your books for me. Than you.